I guess if you put a negative word in like 'not', it makes it difficult to word the thing you want to turn the situation around to benefit you without being negative; try using a thesaurus/synonyms to use alternative words. I think in some spells the word 'not' (even written down) can be mistaken for 'knot' and symbolises binding; which can be bad news depending on what spell you are creating. "So and so will not get this job"
"So and so will not take this job"
"So and so won't get this job"
"So and so won't take this job"
"I want 41 hours a week at so and so, person will no longer want the hours and the hours will be given to me" ? My dilemma is, I causally work for someone who runs their own businesses but is never in the store as they own a home catering business as well; this business is only a year old but from the start I was the third person to be employed out of about 10 staff members, I have done the most work out of all of them, I have done hours of advertising and marketing where as the others have come in, done their job and walked out without even cleaning up after themselves; guess who that's left to! I'm often mistaken for a manager and sometimes the owner, which I am not. So far, the first staff member has left, the second, the fourth and the fifth staff member have also left (all different reasons) which should mean I could of received full-time instead of part-time/casual/filling in for others, right? No... The owner has employed a new person to start!?! Where this will be the new persons third job and said they don't really need the hours!! I need the hours... So I need this spell to work. Hello, GeminianDragon, and welcome to the forum. I have never heard it said that God cannot tell one word from another. I think if you make a petition-prayer, your sincere desire will be heard. However, the petition is supposed to describe the current (bad) situation that you want to turn upside down (to the good).It is not supposed to be a wish (about the future). I hope you don't think i am jumping on you, but you brought a lot of unusual stuff here on your post. Ernie is correct. TThe ammonia jar petition is about what is happening now, which you want to metaphorically "turn upside down." This spell is quite simple and is really just a simple reversal of condition, using ammonia. If it helps you to understand it, do not write in the future tense. Just state what is happening right now that you want to turn upside down. Just write it down and turn it upside down in the ammonia. That's all there is to it. Also, when you say, "I think in some spells the word 'not' (even written down) can be mistaken for 'knot' and symbolises binding; which can be bad news depending on what spell you are creating" -- well, i think that is your opinion, and you are welcome to that opinion, of course, but it has no history in conjure. We want to get our subject's name right -- Johnny Ray Jones and not Johnny Roy Jaynes -- but rootwork employs simple, ordinary language. Not is not and knot is knot -- and that is that. If you study the history of the work and always go back to the roots and the basis of the practice, you will find your way easily. No not at all Catherine, any opinions and suggestions are always welcome - we are here to help one another! I think I also forgot to add that there are a few YouTube tutorials on this particular spell. So I’ve gone with “so and so has more hours” instead of what I put previously - that way, as you said, hopefully it will turn in my favour. Again, the petition not about the future. It is about the present situation. Write out the situation on a white slip of paper, which should be both wide enough to wrap on the inside of your jar, and short enough to soak in the ammonia after you turn your jar upside down, that is, reaching about halfway down the side of the jar. The slip of paper is taped to the inside of the jar near the top, with the written side turned inward to hide your intentions from snoops. Pour in the ammonia, until the jar is about half full. Screw the lid on really tight, to ensure the ammonia won't leak. State your situation with strong emphasis, and turn the jar upside down. The ammonia should now cover the slip of paper. Keep the jar in a dark place, such as a closet, and leave it be until the situation is as you want it. Write out the situation as it is now on the slip of paper. The ammonia will end the situation as it is now. The act of turning the jar will turn the situation to go your way. This spell is intended to sit in the dark, upside down, as long as you wish it to be working. It is not a spell to do over and over again. It is not a candle spell. When disposing of jars of liquids, most jar spells will have petitions washed out. You can wash out the jar and reuse or recycle the glass. Smashing or burying the jar lessens the chance that it will be discovered or understood. That is as clear as it gets. and i don't think a youtube tutorial is needed. "Working 20 hours out of 40, others working more then me, bills not being paid." Now when I flip it i am essentially changing it to me working 40 hours and paying my bills. Thank you, j82. That's it, exactly. That is the right way to word it -- you state the situation that you want to turn upside down. So I want to write "(Name) is thinking about getting back with his ex girlfriend" Would that be the way to write it if I want him to stop him thinking about her and return his thoughts to me? I just ordered vigil candles with missionary independent to get work on my behalf done. I've been doing some work on him myself as well. To all else listen to the mods! Yes, shutter, you state the situation that you want to turn upside down. thank you. I just don't want to accidentally state it in a way that would turn it upside down in the wrong direction than I want. Thanks for all your replies regarding my posts. I did do this - using the present situation, I said “so and so has more hours than me” (maybe that’s where I have gone wrong and I didn’t read these replies until now) and like others and a YouTube tutorial said - state your intentions - I did - funnily enough, I did say about how many hours I would like and why! I then put it under some floorboards that no one crosses above (only truly dark and safe place I have unfortunately). Although it may not seem I have done everything correctly - I did everything correctly word for word as others have said and suggested. Unfortunately this spell did not work for me. I’m going to try hot foot and/or candle moving instead. Thanks for your guidance though. One reason we advise and seek readings is because it tells us if the work will be successful, if its justified, and what is going on in the situation. Workers can also ask what work to do for this situation and read the cards. Otherwise we are basically taking a shot and advising on things that do work, such as a person asking what to do with a cold... many people have many things to try based on heritage and family custom, but not all will work for your cold. Last reason and most important is God is the ultimate decider of work and nothing happens without his will. I am not sure what the work situation is but there may be a reason someone continues to get more hours then you which we do not know: has a kid, sick, raising a family etc. I think I would try an alternative method which is to either find a job that offers you what you want or a honey jar to sweeten the job to give you more hours. I have always used the white Vinegar myself. Apple cider vinegar is a favourite on the East Coast. Red wine vinegar is oftenthe preference of those of Mediterranean heritage It should be fine using any of these. One more question? How long is the wait to see of this working? HOW LONG SHALL I WAIT FOR REAL MAGICK SPELLS TO WORK? I'm very interested in trying this spell. I just have one question. 1) I know the most important aspect of any spell is the intention. 2) Is ammonia absolutely necessary? 3) Could we use soap / bleach / nail polish remover / vinegar / or a more natural cleanser instead of ammonia? 4) Has anyone tried this with any luck? 1) I disagree. I think intention is important, but more important is force of will. And if you are working in the folk magic tradition of any culture, respecting that tradition is also highly important, and that includes working the spell as taught, in a folkloric way. 3) No. This not "a spell that uses cleaning products." It is an Ammonia spell. 4) I believe if you go back to page 1 of this thread and read it all the way down, you will find some records of both successes and failures. It all varies. It really depends on your intentions. If your desires and intentions are really strong and create a high vibrations I can happen in a few days. If your intentions and vibrations are low it can take longer. I always say if I’m questioning myself that tell me that I am not sure if it’s working which creates a low vibration. Just an update on my spell / situation. I was going to write more to reply, but I’m a little exhausted by telling my story if I’m honest, I’m sure there is an update somewhere linked in my profile actitivty. Thank you for your words of wisdom though, it is appreciated. My friend did the exact same spell, she is now housed after waiting and there being next no hope for her. So it worked for her - hurray! There has been some positive development with my situation, but I don’t wish to get my hopes up and/or jinx it. It appears to be going by the 3 rule (3 days, 3 weeks, 3 months). There is no rule on 3 3 3, cat discusses this extensively elsewhere on the forum. I would say watch ad wait for signs meaning its not passive. Keep working to see movement and after 3 mo of work, reading etc you do not get results I would start over doing it again, or moving to a new spell. However it is great news that your friend had fast results and you are seeing movement in the work! I am new in the field and on the forum. I would like to know if the petition could be a general situation on a particular topic and person or for each situation I should use a different ammonia jar? Here is an example: my friend and I aren't talking to each other for months. I did apologize etc., nothing is helping. So if I petition "suchandsuch is rejecting me from her life. She is avoiding reconciliation. She is blocking me. etc." can it be written in 1 petition per 1 ammonia jar? The question, as posed, kind of confuses me but I think I understand what you're asking from the example you give. To me, it all seems like the same situation. "Suchandsuch is rejecting me...avoiding reconciliation...blocking me." In my opinion, that is all the same thing so yes, you would write either one of those, or all of those onto your petition. I have a temporary contract and have been told by my company that they only have a few permanent jobs. I am being interviewed but if I am not offered the permanent post then I remain temporary. I am making an ammonia jar to reverse my situation. Which petition is correct because I want to be offered the permanent contract, the interview is in the next few days. Is this a correct way to write the petition? Is one better than the other? 1. I am not a permanent [role] with [name of company]. 2. I do not have a permanent contract as a [role] with [name of company]. I feel like they are both fine to use. When I use ammonia jars, I try to make the petition as concise and short as possible so it's a direct hit to that specific thing but both of your ideas sound great to me. The second one is a bit more specific and might make you feel better about it overall that you hit the nail on the head. But they're both good! I agree with ScorpioKate that they both sound fine so pick the one that more closely defines your situation (having a permanent contract as (role) or being a permanent (role). Only you can decide that. Miss athena and scorpiokate thanks I made my first two jars yesterday for other purposes. I will make the one for the job too. I undertand you write the situation as it is now so it can be reversed. I may be confused but will writing something like this for example work in an ammonia jar. I dont have a nice car? I have not attended a fun party with single men? Would it reverse the situation or the words because you are using positive words such as fun, single and nice? It reverses the situation but there has to be a situation present for that to happen. I understnad that the two examples you havw above are probably just examples but the first one, you gave I would not do an ammonia jar for. I would opt for drawing work. The second, how many fun parties are taking place around you on a regular basis? ? I would only use an ammonia jar spell for this if, say, there was one you didn't make the list for and you waned to "turn that situation around" so that you get invited. Dr darensbourg those were poor examples but I was trying to think of some with positive words because I sometimes get confused whether its reversing words or the whole situation. Example like I have not been asked out on a date by an attractive single man. Its an example to find out whether using the words attractive and single would reverse the situation so that you are asked out by an attractive man and not one thats not attractive or taken. I hope you know what I mean. So to reiterate, it reverses the situation, not the words per se however reversing the situation will result in some words or the phrase being modified to accomplish the goal. For example your very first post about this.. You said, "I not have a permanent contract as a (role) with (name of company)". But when it comes to pass, the opposite will be true therefore the sentence will.have resulted in a modification by the removal of the word "not". Simply put... no. You will not manifest the antonym of that which you request. I was just reading your responses (I hope you see this) and something reminded me to tell you this. If you have a Tarot deck or even just an app on your phone, you can give yourself a reading on the situation and ask something like "what's the current situation here?" Or whatever. If you get a lot of reversed cards, you can do an ammonia jar on that. That's pretty much how I've done most of my ammonia jars. I consider it a sign that that's the right work. I even will print out the reversed cards on the petition paper, write the petition briefly, and then when the jar is turned over, so are the cards. It's a really good way to get the message across. So for your career issue, I might ask the cards, "what's keeping me from getting this permanent position?" or "is there anything keeping me from getting it?" and I'll pull 3 usually.If there are reversed cards, I'll put them in an ammonia jar. Even if there's just one reversed, I'll put only that one in the jar and do additional work. I agree with Dr. Darensbourg though, that the ammonia jar is good, but might not be the best way to hit this situation. I usually only use them when something's gone wrong, to turn the wrong situation into a right one. 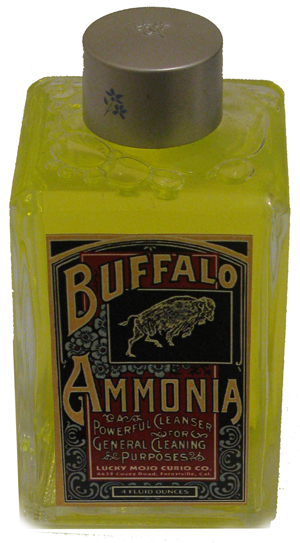 But if you still want to add the ammonia jar, maybe try it with the reversed cards, if you get any, but also do other drawing work and keep the ammonia jar only as an additional hit. I got some questions. I read in some places that when writing petitions or situations we have to: (1) avoid writing negative tense words such as “NOT, DON'T, DOESN'T, NEVER, CAN'T”. Also that (2) they have to be written in present tense. However, I have seen examples using NOT, DON'T and even examples using past and future tenses. C) "Person's first name avoid to communicate with me? 1) Which situation description should be more appropriate: A, B or C? I would like to use A or B instead of C.
2) May I use only the first name or the name I used to call that person (I called her by her last name) or do I need to use her official first and last name? 3) May I use NOT, DON'T, DOESN'T, NEVER, CAN'T? 4) May I use any tense? First of all, welcome to the Lucky Mojo forum. I don't know where you got the idea to not write negative situations on an ammonia jar petition. The purpose of an ammonia jar is turn an unwanted situation around, so if that unwanted situation concerns negative behavior then you would use that language to describe the current state of affairs. The act of turning the ammonia jar upside down helps to bring about a successful (and opposite) outcome. In the situation you describe, I would go with A since the opposite of that would be your target communicating with you. As a general rule, I avoid conditional language in petitions like "John Doe wants to communicate with me" or "John Doe will desire me" because manifestation may just mean they will want to communicate or desire me, but won't take action. State what you want to have happen as if it has already happened. Of course in the case of ammonia jars, you state the situation as it is but still avoid using conditional language. In that case, instead of writing "John Doe doesn't want to talk to me" I would write "John Doe is not talking to me" as the opposite of that would be that he is talking to me. Use your target's full name, not a nickname or partial name. I hope this makes sense and is helpful. Good luck. Thank you Miss Athena. I really appreciate your prompt response. I will make 3 jars. Since I want her to contact me via Messenger or text or WhatsApp, for example, in the first jar I will write "Full name is not communicating with me". I also want her to talk to me again when she sees me in person, in the second jar I will write "Full name is not talking to me". Finally, I want her to go to me (make the first move) whenever she knows that I'm in a place close to her or whenever she sees me in person, in the third jar I will write "Full name is not coming up to me when I'm close to her". I think is unnecessary to add when she sees me. I would like your opinion. Thanks again.